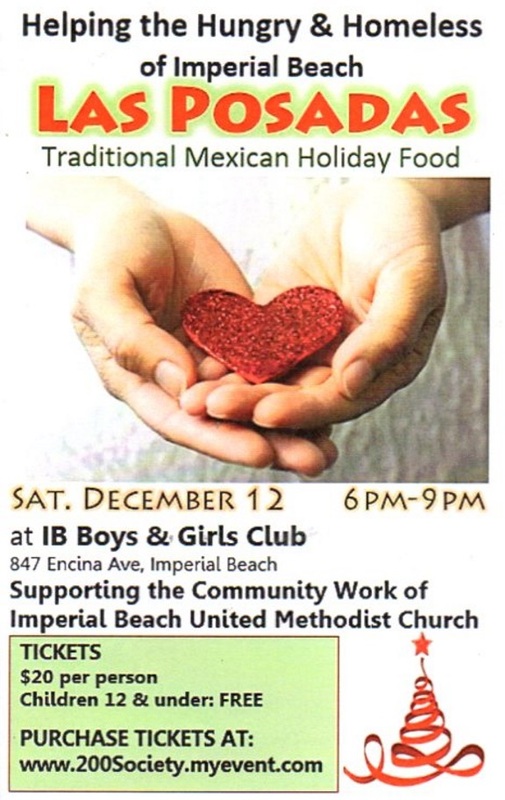 Saturday Night at 6pm come to the Boys & Girls Club and enjoy Las Posadas and enjoy a Traditional Mexican Holiday Meal and Help the Hungry & Homeless of IB! Las Posadas, Helping the Hungry & Homeless of IB, Traditional Mexican Holiday Food. Saturday December 12th at the IB Boys & Girls Club from 6 to 9pm. 847 Encina Avenue, Imperial Beach, ca 91932. Tickets $20.Children 12 and younger eat free. Sponsored by the Imperial Beach United Methodist Church.